Spawforths provide regular support to local authorities in drafting, examining and reviewing Council’s evidence base, Development Plans, Strategies and key policies. Spawforths were commissioned by Selby District Council as planning and engagement consultants to undertake a Market Town Study of the three principal settlements in Selby District, including Selby, Tadcaster and Sherburn in Elmet. 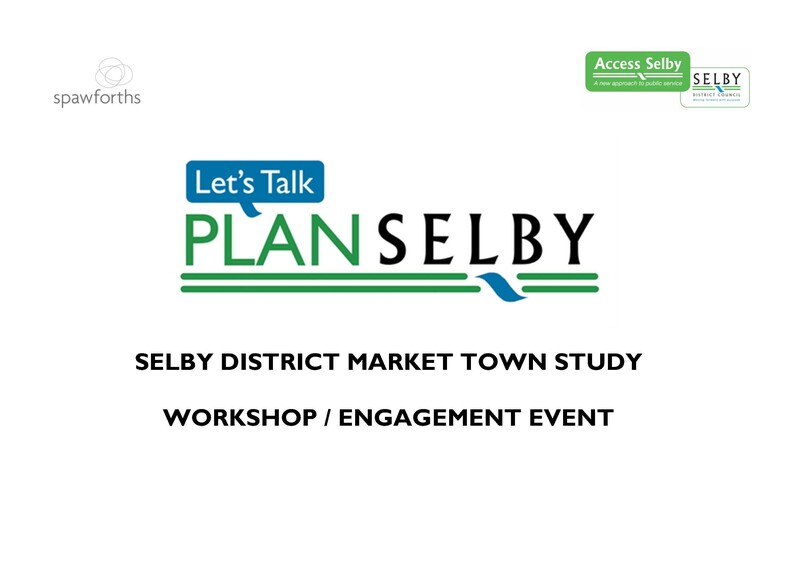 The purpose of the Study was to inform decisions to be made in PLAN Selby, the Council’s emerging Sites and Policies Local Plan and Issues and Options and further consultation stages of the Plan. The Study involved a review of existing and draft evidence base prepared to support PLAN Selby and focused engagement workshops with key landowners and local stakeholders, which informed a vision, objectives and growth options for each town. The aim of the Study was to ensure the community and other stakeholders had the opportunity to shape the plan before a further consultation stages on PLAN Selby that is planned for early 2016, whilst ensuring that emerging visions vision, objectives and growth options are in conformity with the Core Strategy and emerging evidence base, given the Market Town Study will form the evidence to support PLAN Selby at the Examination in Public.